At the Toledo show, one of my pickups was an 11oz Coors Flat Top. I think it’s my first 11oz can. I was aware of 10 ouncers as I have several. Never gave it much thought until now. Looking through your Newspaper Archive, I noticed that in the late 50’s, domestic brands were advertising 11oz cans in Hawaii newspapers. I know that the original Primo aluminum can was 11oz. Does anyone have any info on why the one ounce difference apparently became so prevalent in Hawaii? Looking through the Volume One Supplement, the first 40 or so 11oz cans that I found, the majority were by West Coast Brewers. Has anyone ever done an 11oz Composite? I’d appreciate anyone sharing what they know about these 11 ounce cans. Thanks! I wonder if all 36 brands had 11oz cans? These are the 11 ounce brands advertised in Honolulu newspaper ads. Last edited by MI-Cans on Thu Mar 14, 2019 3:10 pm, edited 1 time in total. Wasn't it a tax thing? Some states passed a tax on 12 and 16oz containers.....So they made the cans 11 and 15oz. It was marketing. Price hike necessary many west coast breweries subtracted an ounce. Shoppers were keen on price but majority would not notice content no longer reflected 12 or 16 ounces. This was reconfirmed last fall while, after a 20 year gap, revisited a Sacramento beer distributor. They made their fortune selling Burgermeister. Family operated for over 70 years they always extend the welcome mat when I appear. This topic is discussed when viewing their small can collection, behind the scenes from the general public. So, I'll have to check to see if they were advertising the 11oz cans on the mainland as well as in Hawaii. I kept searching the Volume One Supplement and came up with 100 11oz cans. I'll eventually put out a summary listing. (If I missed any, let me know and I'll update whatever needs correcting and updating.) I did break down the numbers by state and it was obvious that states affected by these tax issues had the most cans. I made collage of them. I also recorded whatever info was available about them in an Excel spreadsheet (so you can add your own notes and I created a PDF of that list for anyone that prefers it that way. Also found two articles mentioning the connection between taxes and these 11oz cans. Edited 03-15-2019 - Revised 2 images along with Excel and PDF files to add Finer Flaver can. Edited 03-15-2019 - Revised 2 images along with Excel and PDF files to add Super X and Black Label cans. Edited 03-16-2019 - Revised 2 images along with Excel and PDF files to add Red Cap Can and remove Jubilee Cans. Last edited by MI-Cans on Sat Mar 16, 2019 10:01 am, edited 4 times in total. Interesting. I did not know Goebel has an 11 ounce can made in Detroit. It would have made for more sense for it to be from Oakland. The composite is missing the Finer Flaver 11 oz. opening instruction can. Yes, but that can is a completely different animal. It's a 12 oz. can that says 11 oz. All files in Post #5 in this thread revised based on info provided. Thank you. @OctoberAle Thanks for pointing that out. If that's the only one I missed after scanning through 5K of can images, then I done goog. But I probably missed more which I'll add when notified. @barfly Thanks for that can. This list was only about Flat Tops. Maybe I'll consider doing one on Pull Tab cans. @mtracy64 Interesting little fact. Probably easier to use existing can inventory, put in one less ounce and label it as such. Thank you. You are missing the Super X from Utah. NOVEMBER 1 & 2 Room-to-Room - November 3rd Show Floor 9-1! REGISTRATION IS LIVE ON THE WEBSITE NOW! I see scott posted info about the Super X as I was crafting my post! Beat me to it! the 11 oz. Kol from Atlantic, Spokane does exist! I was bored and casually flipped a Kol in a tote of $5 flats at a show in Portland figuring it would be from Tacoma like the hundreds of others I'd checked over the years. After I resumed breathing and got my heartbeat down to a safe level, a deal was quickly made. It's the only one I've ever seen or heard of beside the photo in the book. I can post a photo but it probably won't be until Monday. I'm still looking for the Rheinlander as well. @Scott Added the Super X. Thanks for the help. @Rocknchip Added the two Black Labels. I originally found two 11oz Rainier Jubes in the regular Supplement pages. They have a separate Rainier category that I haven't figured out yet. There's a search function that found 4 Jubes in that area. That would only bring me up to six. If there's "X" number in a series, how would they be listed? 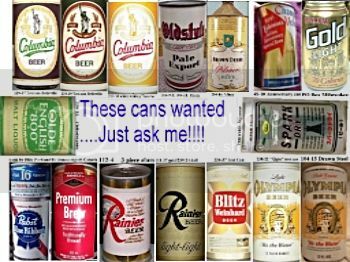 How many series had 11oz cans? I'll have to do some more research there. Also, thanks for your assistance. There are six Jubilee designs that were made in 11 oz. They are the snowflake, squirrels & balloon, men at table, sundial, grain stalks, and brewer with glass. This was the final set that was also made as 12 oz. zip tabs. There are about 6-8 colors of each so that's 36 to 48. Then you have them from both Seattle and Spokane so double the number. I have most of them so could check on the number of colors when I'm at home. I'll post a picture for you later. I see you added the Tuxedo 51 - forgot about that one. There are definitely some others when you get into the variations and multiple cities. For example I think (but am not certain) there is a Hamm's with the 11 oz. on the front from San Francisco that's not in the book. The one shown is from Los Angeles and good luck finding one as they are very scarce. how to get most of the colors inserted. I currently have about 350 cans photographed without really searching them out. Scene: (12 Party, 6 Cartoon, 6 Brewery ) with a few variations of these also. I am in the process of showing all these here. I currently have about 50 cans pictured so I encourage people to check it out. As things slow down in other photography areas, I will be spending more time on this. As for the 11 oz. cans, what I know about the KOL from Atlantic is that there was a six pack found years ago that most of them ended up in KC. The composite posted is missing the Red Cap from Tacoma. I can see that the Rainier Jubes are going to be a problem. I am removing them from this composite and will start a separate one for just them. They are a completely different animal. I appreciate everyone’s input. When done, maybe we’ll end up with a definitive and accurate list of these 11oz Flat Top Cans. I agree with your assessment as to the 11oz Rainier Jubes. They are in the “Brewery” series with six designs. When I create the new thread for these cans, I’ll include reference material form the BMV and the Landy/Wolpe/BCCA catalog. Yes, I tried to sneak that Tuxedo 51 in but you caught me! I attempted to find all the 11’s in the supplement but when you’re scanning 5,000+ image texts, you’re bound to miss something. It gets kind mind numbing…if you know what I mean. I’ve added the Red Cap Ale from Tacoma to the list. Thanks for your explanation. I went to your series link and selected “Brewery” because that’s where the 11oz cans are in. You say there are 6 designs yet your link shows 7 spots?? The list and image I put up are based on what’s currently in the Volume One Supplement. I can’t add yours until they’re added to the Supplement. Hope you can understand that. It would be beneficial to those working on the supplement if you could provide images of the ten cans you mentioned. I’d suggest a frontal shot of each can. Then make sure that for each one, you include an image of the contents line showing 11oz, as well as an image of the variation you’re not seeing in the Supplement. You can either post the images here or pass them on directly to any of the people working on the Supplements. Their names have been posted here several times. "More Life Naturally" but the slogan is "Beer with the light touch" Still need to find flat sheets to get the photos of some variations. I had a chance to upgrade the can but did not realize it was so tough.Someone pointed it out to me at a show but we already had one. Don't forget to show a shot of the mandatory on the back of the Kol. Here is a front and back photo of 11 oz. Kol from Spokane. I've also included the common one from Tacoma for comparison. Incidentally the one from Tacoma is still full and all original versus one of the thousands of unfilled examples that came out of the brewery. Here are the 11 oz. Jubilees from my collection. The first photo which has more cans are all from Seattle. The second photo is Spokane. I'd never bothered to sort them this way before so had not idea I had quite a few more from Seattle. Whether that makes the Spokane ones more difficult or not I have no idea. Typically the places I go dumping are more often in the Seattle distribution area so that may be why. I also can't say whether all of the same cans that were made at one city were made at the other or whether every design was produced in every color. Love the Kol atlantic... lot more 11 oz jubes then I thought! I made a trip to the Davenport show Sunday and I picked up a Hamm's Draft SS flat top from LA 11oz. It looks rolled so I am not sure it is a real can but I seen to remember a few others popping up recently so I think it is a true variation. There is also two variations of the Hamm's sunshine 11 oz 1 079 01 0. It comes from LA and San Francisco. Within those two there is a minor variation of the can ( They come with and without the trademark R in a circle on the face). Do not know if you get into that minor of variations.